It’s Resistant to Chemical Corrosion – This is why we developed chemical sensing cable. Our customers wanted to detect leaks in more challenging environments, and they clamored for a cable-based solution. Our chemical sensing cable is constructed of components that are inert to most chemicals. That’s right – expose it to corrosive chemicals and it won’t break down. That means you can detect leaks of corrosive aqueous chemicals, and detect leaks in environments where other cables will decompose. It’s Strong, Durable, and Reliable – The cable’s abrasion-resistant polymer core increases its strength and durability, and the cable’s sensing wires are enclosed in a non-conductive polymer mesh to help eliminate false alarms. 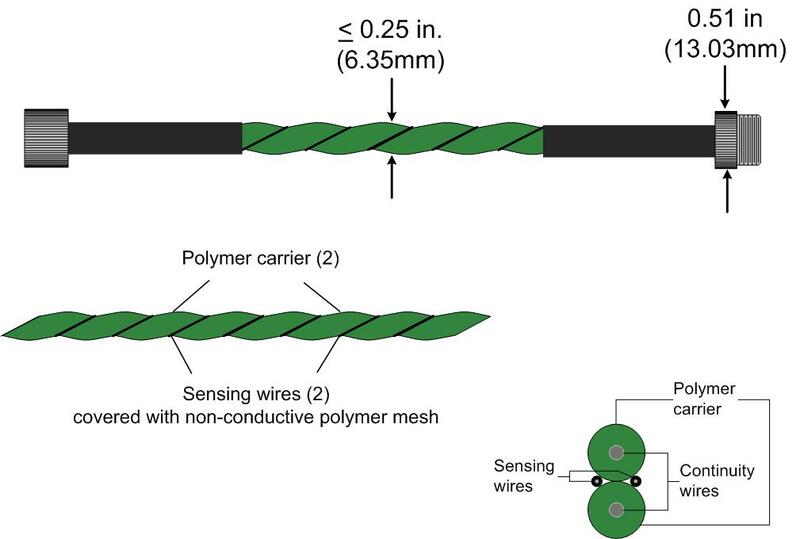 Robust Connectors Keep it All Together – Cables are assembled with mating metal connectors that will stand up to chemical exposure. Connections between cables and connectors are sealed with a resilient heat shrink tubing to keep chemicals out. The durable mating connectors make it easy to install new systems and to add additional lengths of cable to existing systems. An Even Faster Reaction Time – Chemical sensing cable reacts even faster than our orange sensing cable. Mind you, the orange sensing cable reacts very quickly to the presence of a leak. The green cable reacts even faster – it’s pretty much instantaneous. Keep in mind there are other factors that contribute to annunciation time, like the type of controller connected to the cable, the cleanliness of the cable, and the operating environment. But we can tell you this: our chemical sensing cable reacts faster than any of our other sensing cables. Chemical sensing cable is designed to detect the presence of conductive liquid acids and bases, and to resist corrosion from these chemicals.